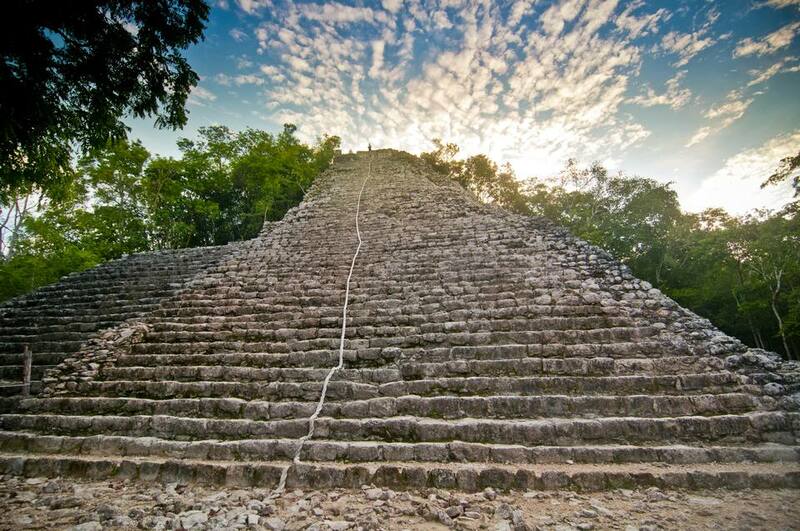 At 137-feet tall, Nohoch Mul, which means "great mound," is the tallest Mayan pyramid on the Yucatan Peninsula and the second tallest Mayan pyramid in the world. It is located at the archaeological site of Cobá in Mexican state Quintana Roo. Although it was discovered in the 1800s, the archaeological site wasn't opened to the public until 1973 because the surrounding thick jungle made it too difficult to get to. It's still off the beaten path but is well worth the trip, especially if you're in Tulum, which is just a short 40-minute drive away. Along with the pyramids at Chichén Itzá and the oceanfront Mayan ruin at Tulum, Nohoch Mul is one of the most significant and popular Mayan sites on the Yucatan Peninsula. This particular pyramid is the highlight of the archaeological site of Cobá, which means "water stirred (or ruffled) by the wind." Nohoch Mul is the main structure at Cobá and from where the Cobá-Yaxuná causeway leaves. This network of stone causeways features upright sculpted and engraved stones called stelae that record the history of Mesoamerican civilization from as far back as A.D. 600. One such engraving marks a population growth to about 55,000 people between A.D. 800 and 1100. The entire site spans about 30 square miles, but the ruins cover four miles and take several hours to explore by foot. You can also rent bicycles or hire a chauffeured tricycle. To get to the top of the pyramid, you'll have to climb up 120 steps. Make sure to take note of the two intricate diving gods over the temple's doorway. From the top of Nohoch Mul, you'll get breathtaking panoramic views of the surrounding jungle. It's recommended to get there early in the morning to beat the crowds and have the whole place to yourself. Nohoch Mul is located between the towns of Tulum and Valladolid. It's an easy day trip from Tulum and Playa del Carmen. From Tulum, drive the Coba Road for about 30 minutes. You can also take public transportation or sign up for a group visit. You may also want to tack a trip to Cobá onto a visit to Chichén Itzá, San Miguelito, or other ancient sites in the Yucatan Peninsula.